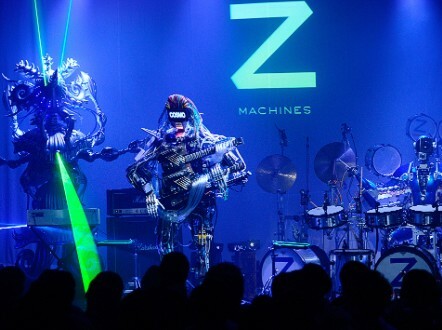 Meet "Z-Machines," the three piece robot band bringing a whole new meaning to electronic music. The band, created by engineers from the University of Tokyo, include a guitarist with 78 fingers, a drummer with 22 arms, and a keyboardist which shoots green lasers. The band is set to release a five-track EP, composed by British recording artist "Squarepusher," also known as Tom Jenkinson. "Can these robots play music that is emotionally engaging?' asked Jenkinson. "It's a fascinating question, and one that I've tried to explore in this project. I'll let people make up their own minds." The two meter tall guitarist -- called "March" -- features 12 picks, and is able to hit a note every eight milliseconds. 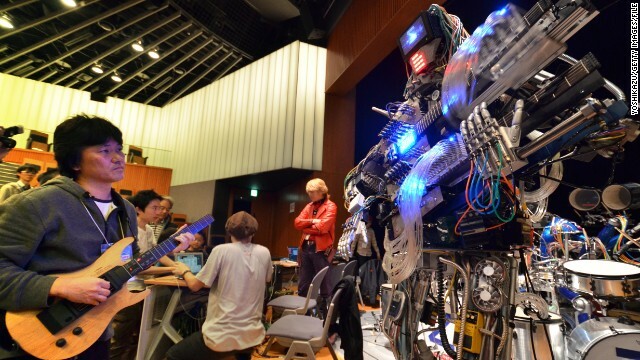 A man plays an electric guitar to control robot guitarist 'March' during a technology fair in Tokyo. What will the future hold for electronic music? (CNN) -- Quick math question: What has 78 fingers, 22 arms, and no brain? 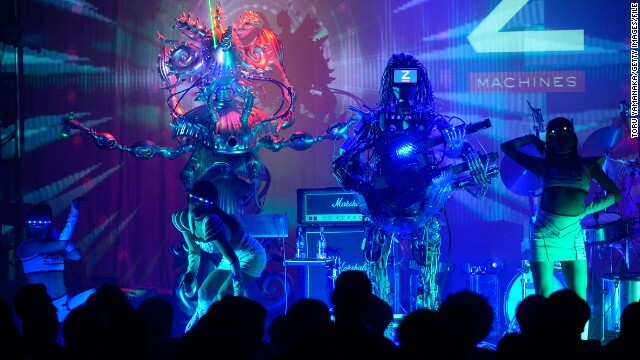 Answer: "Z-Machines," the robot band with a surprisingly human sound. Listen to this three-piece with your eyes closed and it could be any group of musicians plucking a guitar, twinkling on an electric keyboard, or beating a drum. Sure, there's a synthesized quality to the music -- which sweeps from orchestral to experimental rock -- but what band doesn't get a little help from computers these days? Open your eyes and you'll find something very different indeed. For starters, the guitarist is a humanoid looming two-meters-tall, with 78 fingers sweeping across the glowing instrument strapped to its torso. The rocking robot -- called March -- bangs its impressive mane of multi-colored cables in time to the music, albeit a little jerkily. Seated a little behind is Ashura, the drummer with 22 arms extending like a futuristic octopus and playing four times faster than any human ever could. And then there's Cosmo, perhaps the most alien band member of all, a keyboardist with green lasers hitting each key with pinpoint accuracy. 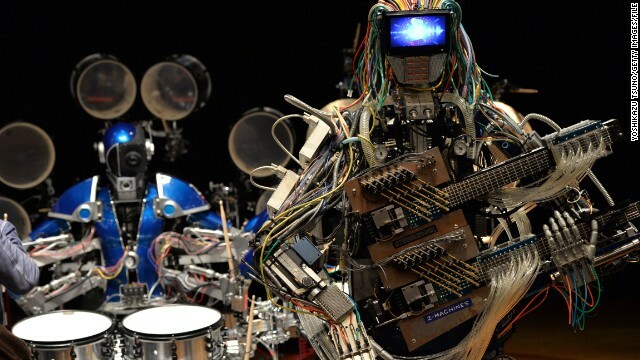 Can these robots play music that is emotionally engaging? 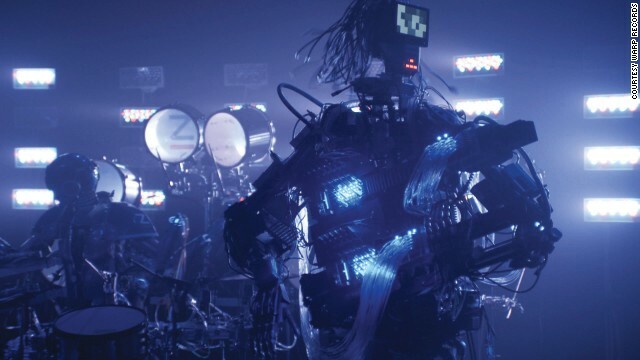 "The footage of the robot performer is almost like watching a broken human, with a skeleton of steel, and oil for blood," said Tom Jenkinson, better known as British recording artist Squarepusher, who composed the music for the mechanical band's new EP. "Using robots has this eerie narrative associated with it -- the twilight area between human and machine. It's just a box of tricks, but it still haunts us because we see it as an impression of ourselves." Created by engineers at the University of Tokyo, the robot band uses around 300 kilowatts of electricity, which designer Kenjiro Matsuo admitted: "Is a big amount of power." "We just bought a power board which has a switch -- many people can try to make this kind of robot in their house now." Visitors at a technology fair in Tokyo test out the giant guitarist. 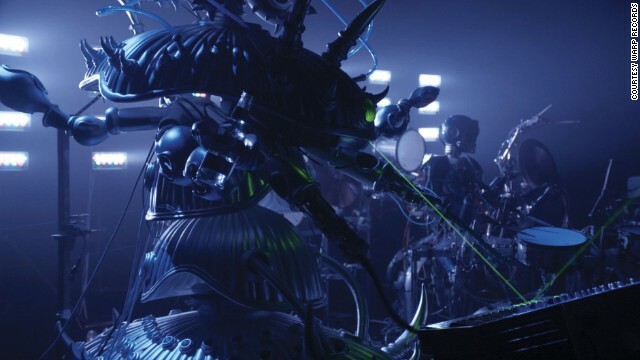 The machine musicians made their stage debut at a "Future Party" in Tokyo last year, performing an electro-rock mash-up for the screaming crowd. Girls in space-age outfits gyrated around guitarist March, whose screen face flashed slogans like "Party!" Each time the audience raised their drinks in the air, the band would play faster, in an event sponsored by the drinks company. Now the machine musicians are set to release a five-track album, with the first single "Sad Robot Goes Funny," a more melancholy tune than you might expect from a band without hearts. "Can these robots play music that is emotionally engaging?' asked Jenkinson, who composed the song and has experimented with electronic music in a career spanning two decades. "It's a fascinating question, and one that I've tried to explore in this project. I'll let people make up their own minds." 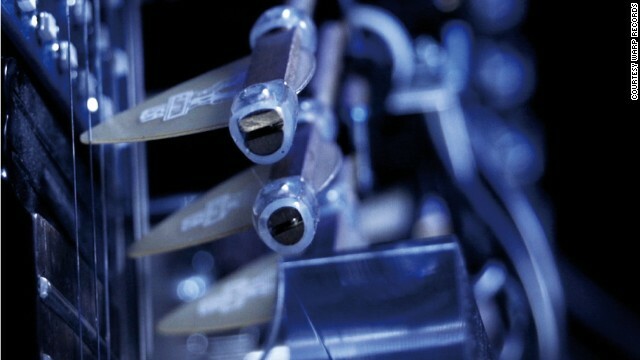 So how do you create music for a machine with 78 fingers, which can hit a note every eight milliseconds? "It's just another way of making sound, but in this case what's interesting is the aesthetics of the instrument," said Jenkinson. Are you ready to rock? Z-Machines in action. "Just like when you're writing music for a human, there are certain possibilities and certain limits. The robot guitarist for example, can play much faster than a human ever could, but there is no amplification control." If you imagine that this is the start of a robot revolution, never fear, we've still got a fair way to go before people tire of flesh and blood performers, said Jenkins. "Is the performance going to be less compelling because it's robots?" he asked. "For me, part of the appeal has to do with hearing a familiar instrument being 'played' in an unfamiliar fashion." 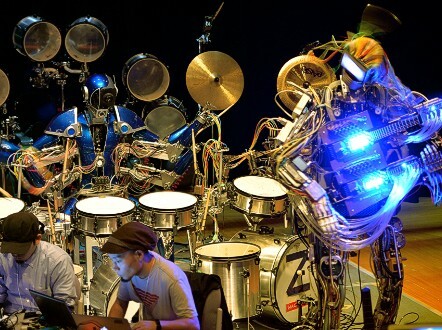 And behind every robot musician, is a human being bringing it to life.